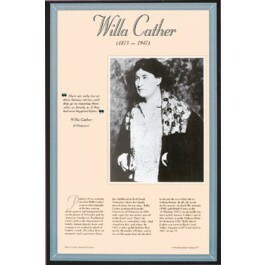 This unique educational poster of writer Willa Cather features a striking photo of her, as well as a quote from "O Pioneers!," and concise biographical text summarizing her life and career. 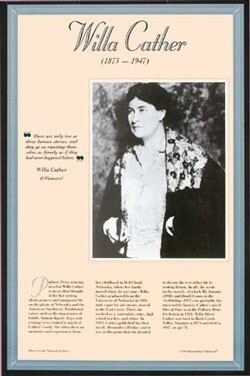 Much of Willa Cather's work is based on the importance of family, human dignity,hope,and courage. She often drew on memories and experiences from her childhood in Red Cloud, Nebraska. Her novel "One of Ours won the Pulitzer Prize for fiction in 1923. This poster is a great way to introduce students to this important American author.